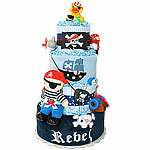 Our most popular diaper cakes for baby showers. 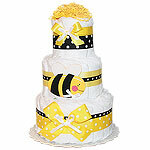 These baby diaper cakes are made of approximately 35 - 75 premium diapers. 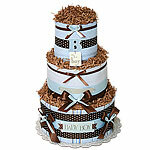 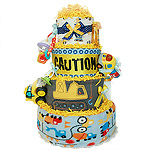 Our large diaper cake makes a great present for parents and the baby. 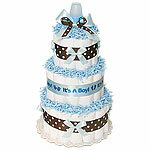 Our diaper cakes for baby showers feature lots of baby items and look just plain amazing. 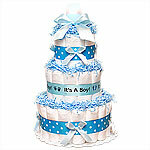 They make great centerpieces for any baby shower and serve as great conversation starters. 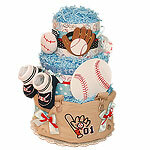 Very memorable and unique gift for expecting parents. 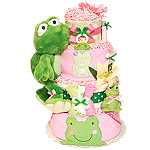 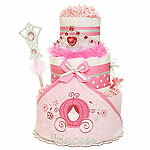 You can view all of our diaper cakes here. 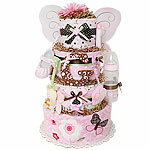 Diaper cakes for baby showers make great gifts. 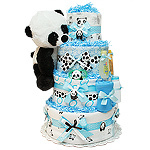 New parents are usually very nervous about baby supplies, and giving diapers in such an original manner when they look plain amazing is a great idea. 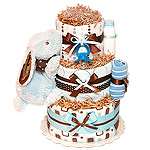 Not only parents will receive diapers and other supplies but these diaper cakes make great baby shower centerpieces and are very memorable too. 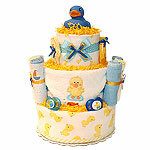 Diaper cakes for baby showers are great conversation starters.